First Aid at Work Level 3 (VTQ) blended part 2 for those who have completed the online part. First Aid at Work Level 3 qualification (FAW) is ideal for most businesses whose risk assessment has identified that they require a fully trained first aider for their workplace. All courses are delivered, evaluated and quality assured to meet the new guidelines set out by the HSE in October 2017 and meet the requirements of the First Aid at Work (First Aid) regulations 1981 and subsequent 2017 changes. 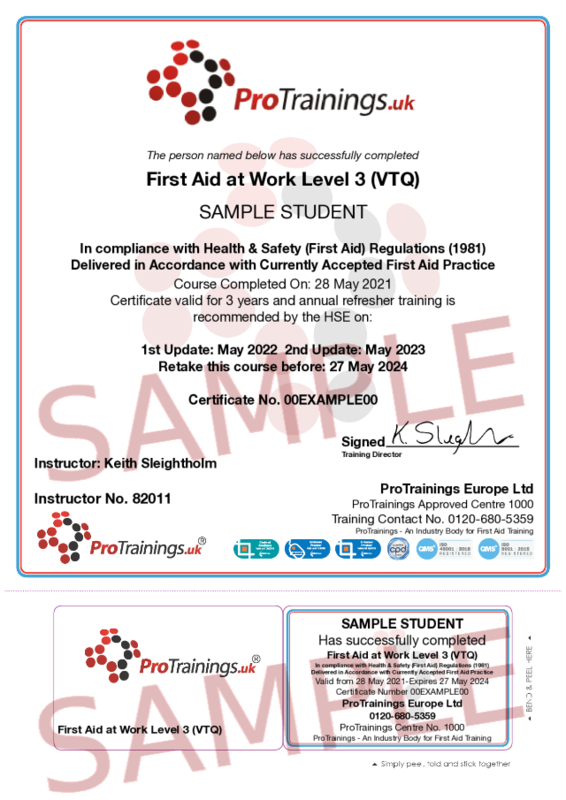 ProTrainings Vocational Training Qualifications (VTQ) are fully recognised by the HSE as Trade Body Qualifications. This blended FAW course meets all of the requirements under the HSE and Awarding Organisations and is available as aProTrainings or Regulated Qualification. If you prefer the traditional 3 days First Aid Training we can do that too, just contact us for more information. This course comes with 12.0 hours of CPD, although the time to complete the course online may be less than this.